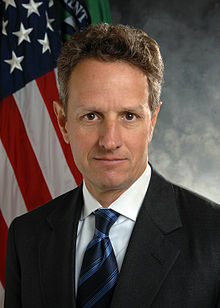 Timothy Franz Geithner (born August 18, 1961) is an American economic policy maker and central banker who served as the 75th United States Secretary of the Treasury, under President Barack Obama, from 2009 to 2013. He was previously the president of the Federal Reserve Bank of New York from 2003 to 2009. We believe in a strong dollar … Chinese financial assets are very safe. I believe deeply that it's very important to the United States, to the economic health of the United States, that we maintain a strong dollar. This page was last edited on 26 August 2018, at 21:06.